A dental sealant is a plastic coating applied to the chewing surfaces of back teeth. Grooves in these teeth are so narrow that a toothbrush cannot fit into the spaces to remove plaque. Dental sealants are recommended to prevent dental decay within the grooves of the tooth's chewing surface. Children should receive sealants on permanent molars as soon as they erupt (about ages 6 and 12 years). First - The tooth is etched with a mild acid to create retention for the sealant, then rinsed and air dried. Second - The liquid sealant is painted into the grooves of the teeth. Third - A high intensity light is used to activate the liquid plastic to harden. Sealants are simple, painless, and require no drilling. While they may last up to 10 years, 2 to 4 years is a more reasonable estimate. Sealants can be highly effective in protection against cavities provided the sealant is continuously monitored by a dentist. 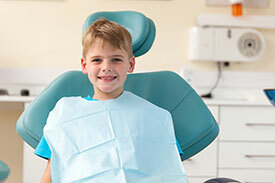 Sealants should be checked by a dentist during regular check ups and if needed they can be re-applied. Why aren't sealants used on ALL teeth? The liquid plastic is designed to flow into and fill the pits and grooves of the teeth. The plastic does not work on the smooth surfaces of the teeth, like the fronts and backs and sides of the teeth. Sealants can provide 100% protection from dental decay or "cavities" on the chewing surface. Research has shown that when placed over very minimal dental decay, the decay will no longer progress.